Just got back from a 16-day road trip. Following my usual post-travel routine, the morning after arriving home I pulled out the bathroom scale, stepped on, breathed deeply, and peered through squinted eyes at the numbers. I’d gained two pounds. HURRAY!! Okay, weight gain is not a reason for me to celebrate, but considering on one trip I’d gained a pound per day, and many of my vacations have set the progress of my health goals back months, two pounds seems very manageable. So what was different this time? Though I’m not officially an expert on fitness and nutrition, I think I can safely assume the following factors made the difference. I shifted my perspective. Previously, I ate my way through trips. In the car. In the hotel. At fast food and chain restaurants and friends’ houses. It was as if eating on vacation didn’t count. (It didn’t – until I got home.) This time, I put the purposes of our journey – to see some amazing sights and visit family and friends – as the focus. Once I mentally established we were not on a culinary expedition, it was easier to modify a few unhealthy travel habits. I made smart eating choices when possible. At home, my first meal is sometimes the only healthy eating of my day. So when faced with the sugar and empty calorie-laden breakfast offerings in hotels, I opted for plain oatmeal, egg, and fruit. At fast food lunch stops, I looked for salads or grilled chicken in small sizes. On-the-road dinners were similar, or, if we both acknowledged not really being hungry, we supped on the cheese, crackers, nuts and fruits we’d brought with us. I brought along a variety of in-transit entertainment. I admit it. Traditionally, much of my in-car and hotel eating is just something to do rather than hunger-based. This time I packed a car-bag like I might for kids, except the “kid” was me. It included audio books (which the G-man and I picked out together from the local library,) my tablet (books and games,) some magazines, and a few simple crochet projects. And, of course, there were some nibbles: fruit, nuts, Kind bars. The crochet kept my hands busy while listening to stories, and I actually completed a couple items. Finally, I took advantage of natural opportunities to move. Fitness rooms in hotels were sometimes an option, but I think the little bits of movement made a bigger difference. Parking at the far end of rest stops and fast food lots allowed for more walking. As the official loader and un-loader of our vehicle, I engaged in daily bouts of bending, stretching, lifting, pushing, and power walking. (We travel like the Beverly Hillbillies!) We walked some tourist stops; I walked with friends while we visited. It all adds up. I certainly don’t want to mislead anyone into thinking I was extraordinarily virtuous. Au contraire! Some days were flat-out sedentary. At the homes of friends and family, I ate and enjoyed (too much of) whatever was served. Including desserts. I indulged in the specialties of wineries and breweries and regional restaurants we visited. Instead of elevating the mundane (hotel food) and commonplace (chain restaurants) to vacation-worthy status, I contained the splurging to culinary delights I don’t have access to at home. It was definitely worth the two pounds! 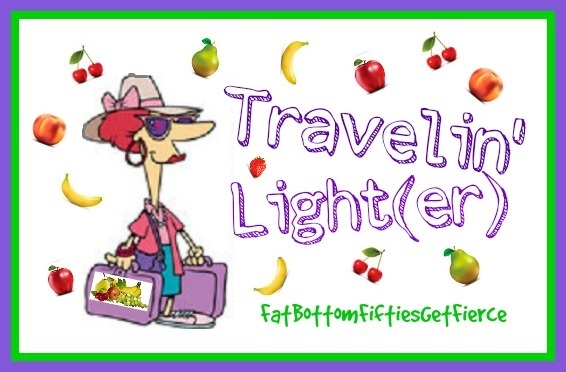 What’s YOUR favorite Travelin’ Light(er) tip? Guest blogger Natine Abreu-Shaw is a recalibrated woman of the Sandwich Generation, who enjoys writing and occasionally mines her mind, flexes her fingers, and publishes her pith at Write-MindedWoman.com – when she is able to take a break from some of her other pet (pun intended!) projects – such as writing as the persona of her fur-kids at their Facebook home Corgi Characters!